Esterbrook SJ fountain pen from the 1950s with a #2668 firm medium nib. Lever filler in green with steel trim. Excellent condition, fully restored and working well. Type Vintage lever filling fountain pen. Product Name Esterbrook SJ Pen. Manufacturer and Year Esterbrook, made in USA -- 1950s. Color Olive green. This color was just called "Green" by Esterbrook. Steel trim and black jewels on either end. Nib FIRM MEDIUM #2668 steel nib is smooth with lots of tipping and a really nice looking feed. The 2000 series of nibs don't have any tipping material. Instead the tines are bent for a "DuraChrome" point. 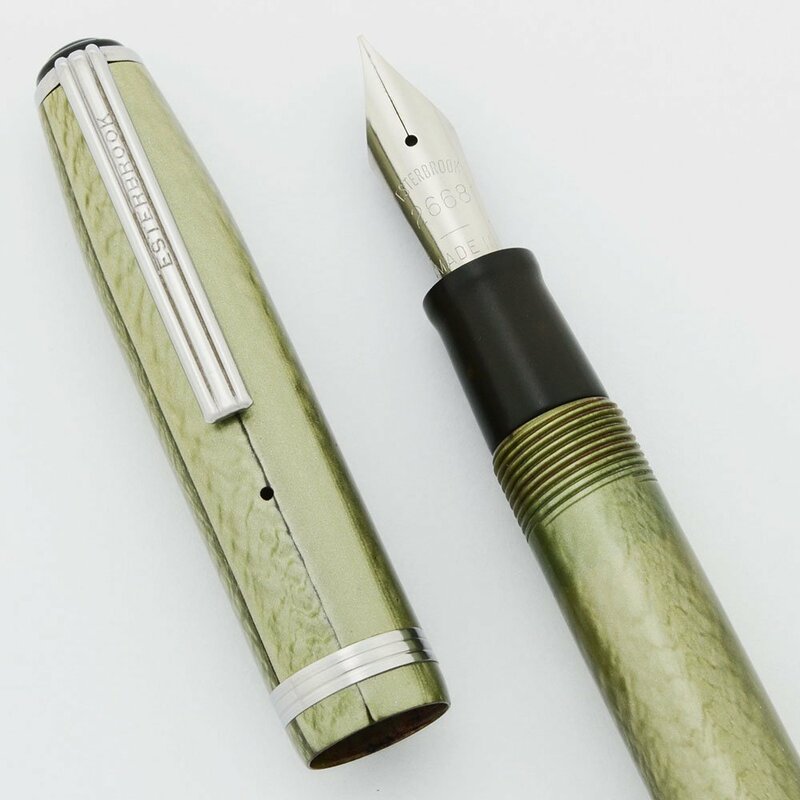 The 2668 nib is cataloged as Firm Medium for general writing. Condition Excellent condition. There are many tiny marks throughout. The pen doesn't look worn but it is not smooth when you run a fingernail over it. The first picture appears to show a crack at first glance, but is merely the color variation in the plastic. Both jewels are in good shape. The imprint is worn, but legible. No cracks, chips, dents, personalization, or plating wear. We've restored the pen and it's working very well.